Brushing twice a day for at least 2 minutes each time is the most effective way of removing plaque. Brushing every morning and before bed dramatically decreases tooth decay. Two minutes is the recommended length of time to remove plaque effectively. Flossing once a day is essential for maintaining gum health and preventing cavities between teeth. Brushing alone is not enough for removing food and plaque which can build up between your teeth. This buildup can lead to bleeding gums and gum disease. Gum disease leads to pain and eventually loosens your teeth. Drink plenty of water! Not only is water essential for your overall health, but it also helps neutralize acid created by bacteria in your mouth. Water also washes out food and debris that bacteria like to feed on. Use a soft toothbrush. Using a medium or hard toothbrush may scrub harder, but can damage your teeth and gums by being too abrasive. 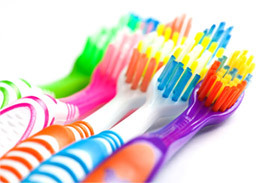 It is recommended to brush in a gentle circular motion and to replace your toothbrush every three months. Frequent snacking increases your risk for cavities. Limit your consumption of sugary foods and beverages and maintain a diet of 3 healthy and balanced meals a day. This decreases your teeth’s exposure to acid created by bacteria in your mouth. Poor oral health increases the risk of developing and worsening many diseases, including heart disease, osteoporosis, and diabetes. Maintaining good oral health is beneficial in improving your overall health and vice versa. During pregnancy, it is vital to maintain good oral health and visit your dentist regularly. Changes in hormone levels often increase inflammation and bleeding of the gums. There is also research linking poor oral health with pre-term and low birth weight babies. The health of your baby teeth affects the health of your adult teeth. Children need their baby teeth until around age 12. Tooth decay can lead to pain and infections. Premature loss of baby teeth also leads to crowding and increased likelihood to need braces in the future. Research also shows that cavities in baby teeth lead to higher risk of cavities in adult teeth! If your tooth gets knocked out, rinse it lightly with water and hold the tooth in your mouth until you can visit your dentist. Do not scrub the tooth! If the tooth itself is undamaged, you may try to position it back into the socket. It is crucial to visit your dentist within the hour to increase the chances of saving your tooth! Visit your dentist every six months. Regular checkups and cleanings every six months to monitor for cavities and remove buildup are essential to maintaining your oral health.